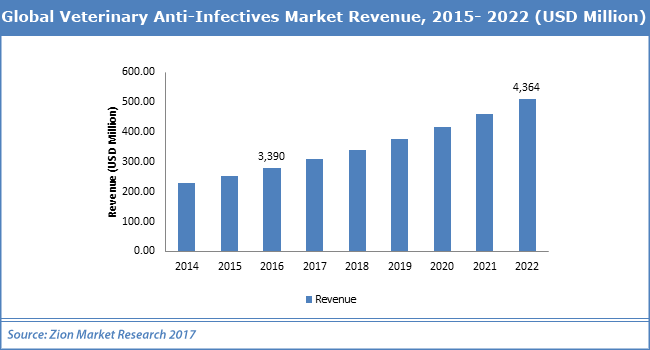 With the presence of a large pool of participants, the Global veterinary anti-infectives market is displaying a highly competitive business landscape, finds a new research report by Zion Market Research (ZMR). Bayer AG, Dechra Pharmaceuticals Ltd, Neogen Corporation, Phibro Animal Health Corporation, Vetoquinol S.A., and Intas Pharmaceuticals are some of the key vendors of veterinary anti-infectives across the world. These players are focusing aggressively on innovation, as well as on including advanced technologies in their existing products. Over the coming years, they are also expected to take up partnerships and mergers and acquisitions as their key strategy for business development, states the veterinary anti-infectives market study. Citing an instance, in August 2018, Precision Health Technologies declared that it received master distributorship for Grazix’s natural animal health products in the North American region from Grazix Animal Health Incorporation and LiveLeaf Incorporation. Reportedly, as per the terms & conditions stated in the deal, Precision Health is expected to carry out distribution, marketing, and product supporting activities for Grazix products in North America. Furthermore, Precision also preserves the right to manufacture Grazix’s products and distribute it in North America. As estimated in this report, the global veterinary anti-infectives market stood at US$ 3,390 million in 2016. Witnessing a tremendous rise during the period from 2017 to 2022, the revenue in this veterinary anti-infectives market is expected to reach US$ 4,364 million by the end of the forecast period. The main drugs available in this veterinary anti-infectives market are antimicrobial, antiviral, antifungal, and antiparasitic agents. Among the four, the demand for antimicrobial agents is relatively higher and the trend is anticipated to remain so over the next few years, notes the research report. “Growing trend of owners of companion animals and livestock to expend more on animal healthcare along with the ability of veterinarians to fulfill the needs of pet owners will drive the growth of veterinary anti-infectives market in the years ahead,” says the author of this veterinary anti-infectives market study. Apart from this, with ownership of companion and livestock animals remaining high across the developed economies, it is predicted that the veterinary anti-infectives market revenue will surge in the ensuing years. In addition, massive domestication of livestock animals and pets for economic purposes such as dairy items, meat, and agriculture is likely to accelerate the expansion of veterinary anti-infectives market over the coming years. Shortage of veterinarians in emerging economies, however, is projected to hamper the growth of veterinary anti-infectives market in the near future. Regionally, North America has been leading the worldwide veterinary anti-infectives market and is anticipated to continue on the dominant position in the years to come, states the veterinary anti-infectives market study. Massive rise in pet ownership along with mammoth demand for nutritious diet for pets & cattle is the main factor behind the dominance of the North America veterinary anti-infectives market. Wide focus on food safety activities along with growing pet insurance trend witnessed in the region is another significant factor that is supporting the growth of this regional veterinary anti-infectives market.